This past October, Becca Cosmetics announced a partnership with Sephora that would bring select products to Sephora stores. Becca Cosmetics will continue to introduce more products to Sephora stores throughout 2013, which will result in a total of 100 new items that round out BECCA’s four unique categories: Complexion, Perfectors, Tints and Ultimates. The brand will also be available in at least 50 Sephora inside JCPenney locations in March with plans to expand into 150 locations by the end of 2013. This is good news if you're already a Becca fan. If you haven't tried this brand yet, Sephora has an interactive merchandising display that delivers a Shade Match Guarantee™ that can help you find your perfect foundation shade. Their color cosmetics are also available at Sephora, as well as on Becca's website. 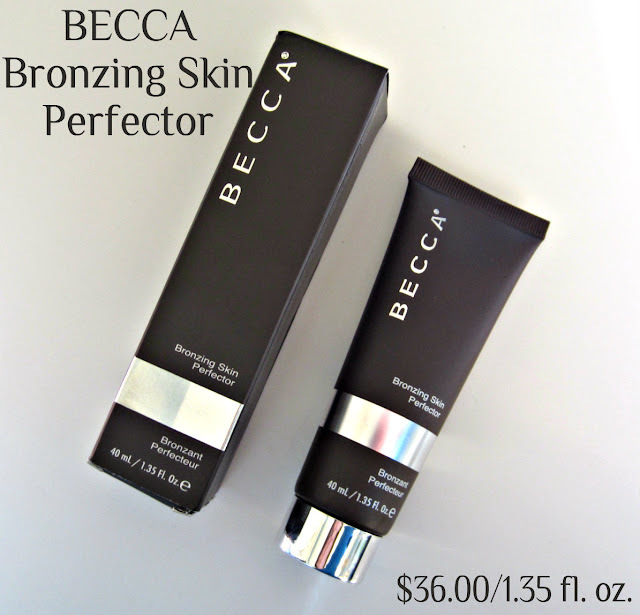 I have a review of Becca's Bronzing Skin Perfector for you today, which is a bronzing creme designed to smooth, even and perfect the skin while imparting a natural sun-kissed glow. This product retails for $36.00 and comes in a 1.35 fl. oz. tube. 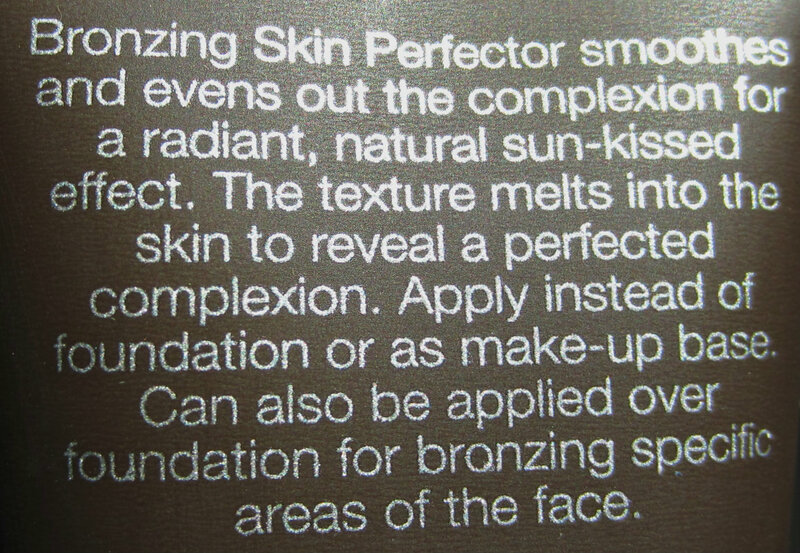 This product comes in one universal shade, and at first glimpse it appears to be quite dark. 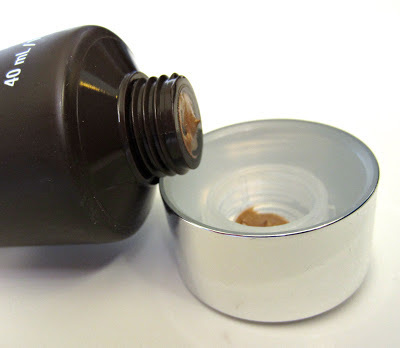 It's lightweight, and glides easily onto the skin over moisturizer or foundation. The first time I began to apply this, my initial thought was that it was way too dark. I dotted it over my moisturizer, blended it, and it wasn't too dark at all. 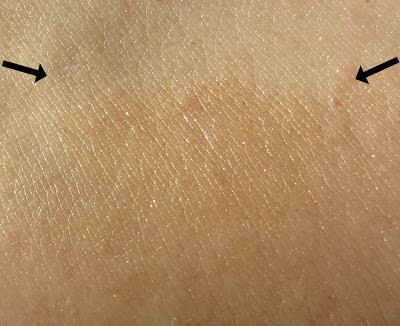 It melts right into the skin and gives a very subtle and natural sun-kissed glow. I also worried that the tiny glitter-looking particles would present themselves as a glitter bomb on my face, but they aren't noticeable at all. It's difficult to get this photographed in a way that it shows up, but I definitely notice the difference it makes when I wear it. Just below the arrows is where I've blended the product. The formula is sheer but buildable, and it's recommended for all skin tones. I sometimes use it alone over a moisturizer then follow with a light dusting of translucent powder, or I use it over my powder foundation. It blends surprisingly well over the powder foundation. Depending on the look I'm going for, I may apply it over my entire face, or just apply it slightly under my cheek bones, down the bridge of my nose, and my on forehead. 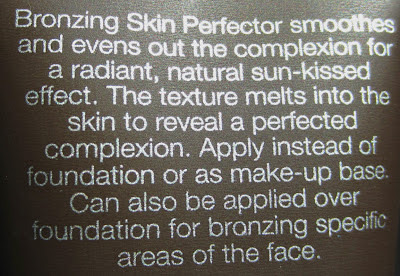 What I love about this product as a bronzing aid is that there are no orange tones whatsoever. It's completely natural looking, and the tiny glitter blends right in, becoming nothing more than light-reflecting particles that diffuse light and add radiance, not sparkle. A universally flattering bronzing cream designed to smooth, even, and perfect the skin while imparting a natural sunkissed glow. This sheer bronzing cream imparts a radiant glow while visibly smoothing, clarifying, and perfecting the skin. Its versatile formula lends a healthy allover finish, blends with foundation or moisturizer to create a custom golden tint, or contours where the sun would naturally warm your face. Infused with antioxidant vitamin E, this formula contains light-reflecting particles that diffuse light so your skin looks softer and younger while adding subtle warmth. This product does not contain fragrance, oil, or alcohol. Have you tried anything from the Becca line? My first Becca purchase was their Pearl Skin Perfector about 10 years ago, and I've yet to try anything from them that I haven't liked. Sephora's F & F sale in November gave me a good excuse to add their Moonstone Skin Perfector and an Ultimate Colour Gloss in Hummingbird to my Becca collection. I received an eMail today announcing their newest product, Ultimate Matte Lip Colour. I think I may need to pick one of those up! *Product featured was furnished for consideration. Sounds like an interesting product!